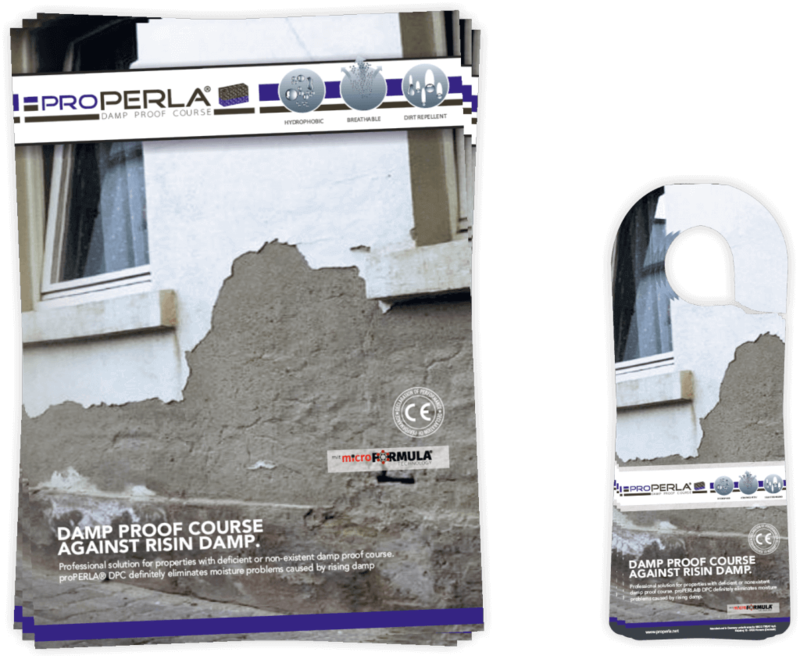 Ultimate damp proof course for the permanent renovation of walls with rising damp problems. Optimal solution for all properties with deficient or non-existent horizontal barriers. 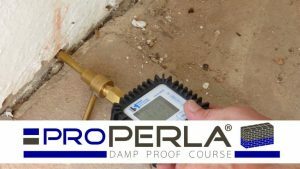 The installation of a damp proof course with proPERLA® DPC eliminates long-term moisture problems due to rising damp. The system penetrates deep into mineral building materials. 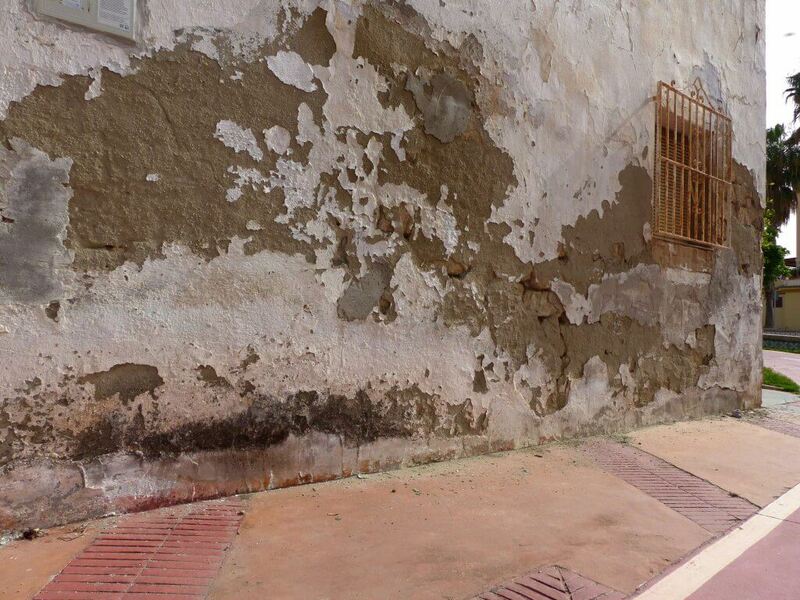 After the treatment, the wall is impermeable to water, but remains fully breathable. Expensive mortars are no longer required. Improve the aspect and performance of your walls. 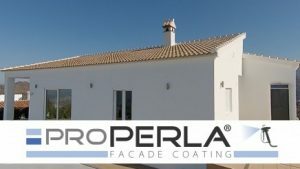 proPERLA® DPC stops the disintegration of plaster and paint, the dissolving of wallpaper or the deterioration of the interior paints due to salt efflorescence. 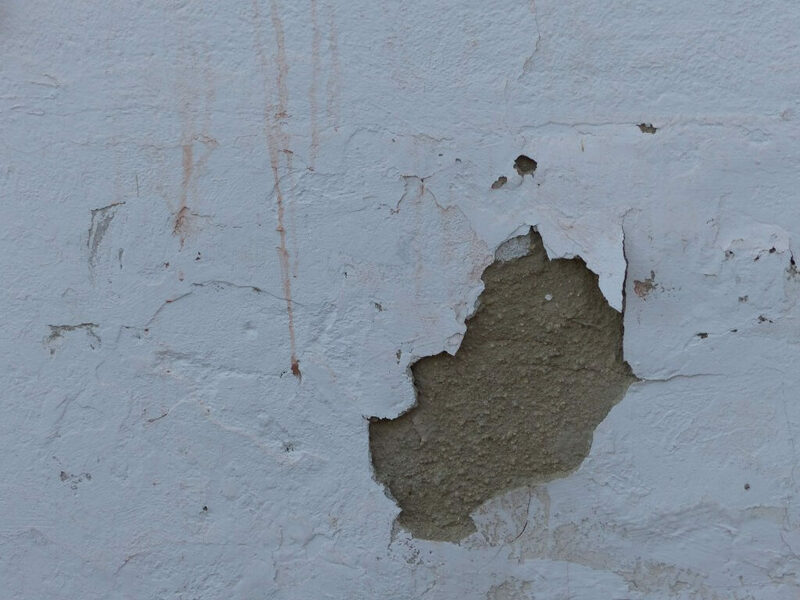 The treated surface can be re-plastered . 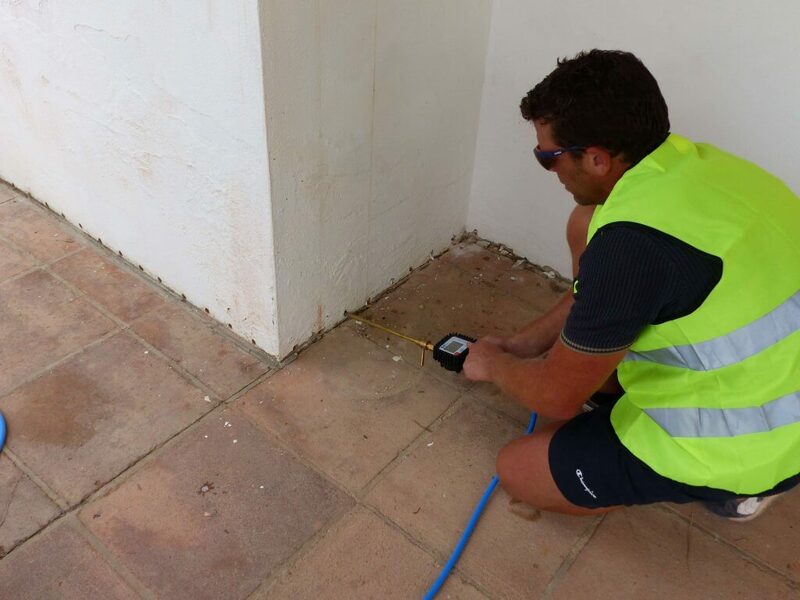 After a curing period of 7 days, the damp proof course will have its full performance. The water absorption is reduced by more than 95%. 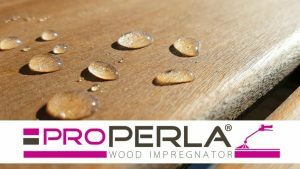 proPERLA® DPC successfully passed various analyzes and fulfills the requirements of WTA and CSTC. 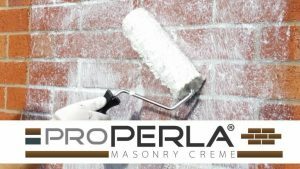 It has been classified as a treatment with an excellent performance for masonry works. A wet core insulation loses its effective insulating properties and is no longer able to keep walls dry. This can cause considerable risks to human health and pets. The treated surface remains breathable. Moisture and air pass easily through the walls from inside to the outside. 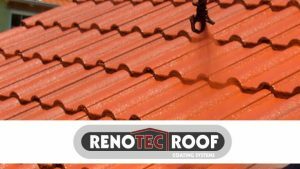 This results in a significant improvement of its insulating properties. A contente of only 5% moisture in a wall insulation or other building materials reduce the thermal resistance by up to 50%. proPERLA® Damp Proof Course Rating : ★★★★☆ 4.9 Based on 862 reviews. 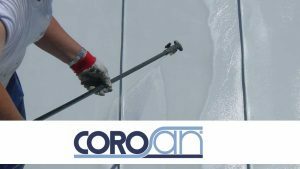 Wet walls and damp walls are a very common problem and require more and more new technologies for fast solutions. Effective renoation, dehumidification, dehumidification, impregnation and sealing are now used in various methods, processes and techniques. Particularly modern techniques that required the fewest structural changes as well as a with relatively low rehabilitation effort meet the highest demands. The most requested dehumidification process are actually various methods of injection technology, which have recently been able to achieve long term results. In a property a properly installed damp proof couurse blocked prevents moisture to migrate up the wall. If this barrier does not exist, or if it is defective and leaking, it will lead to moisture penetration, salt efflorescence and cracking of walls and plaster. These are ideal conditions for the growth of mold and mushroom and can lead to considerable health damage. 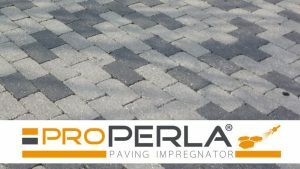 The damp proof course is installed by a precise injection technique. 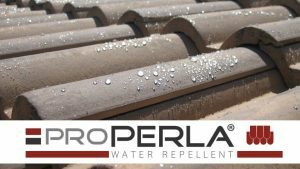 For this purpose, a water-repellent solution is injected into the wall structure by means of an injection process through previously drilled holes. It is completely absorbed by the building material, ensuring a hydrophobic damp proof course. 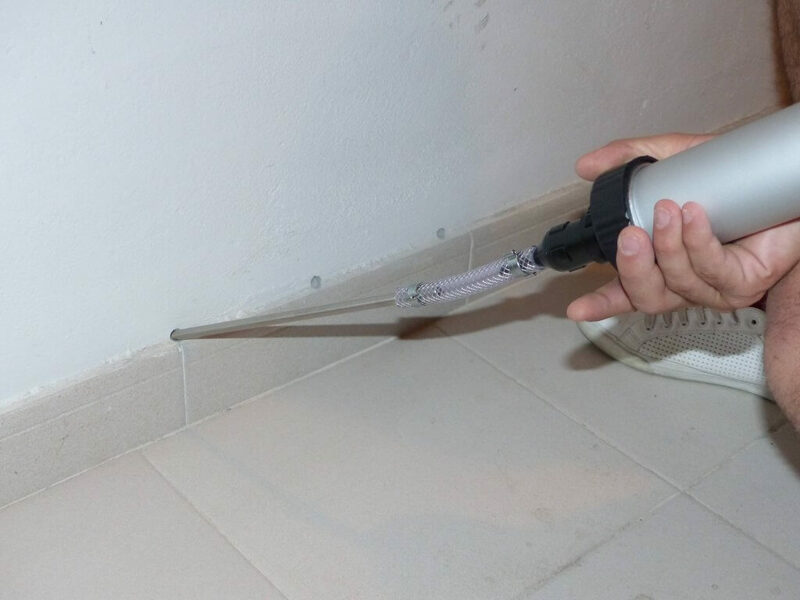 With this injection technique, no masonry work needs to be carried out, which considerably reduces the repair costs. The sealing of a surface can also be successfully considered after the injection technique. Damp proof courses are located in the bottom area of a building and provide the horizontal sealing of a house, which ensures that its walls remain dry. Normally, this barrier is mandatory for newer buildings, but due to several reasons, the damp proof course is not always correctly installed. Rainwater penetrates through the basement floor. Without a damp proof course water can easily penetrate into the masonry and migrate upwards, which would have very nevative effects on the bulding and its inhabitants.